I'm currently sat on the sofa in my pyjamas planning the earliest of all bed times because I've just finished LFWAW15 and it was both amazing and crazy tiring! I've got beauty reports and style snaps on the way soon, but tonight I wanted to show you what I wore to the best show of all, Topshop Unique. I'm still pinching myself that I even got to go and I must say the whole backstage, front of house and catwalk experience was one of the best things I've got to do through this whole beauty industry thing I'm lucky enough to be involved with. I was obviously in a right tis over what to wear (Kendall/Cara/Jourdan were going to be there after all) and in the end went for an outfit I felt myself in with a nod to this season's trends. The skort is back in now so my beloved Zara number got dug out from last year's section of the wardrobe and was accompanied by a new Topshop aztec patterned jacquard tee which created a classic monochrome look that (hopefully) never goes out of style. Add a camel coat, fedora, chunky chelseas and statement lip and we have my Topshop Unique look which went wonderfully with my green juice and it's stripy straw. What a dream. 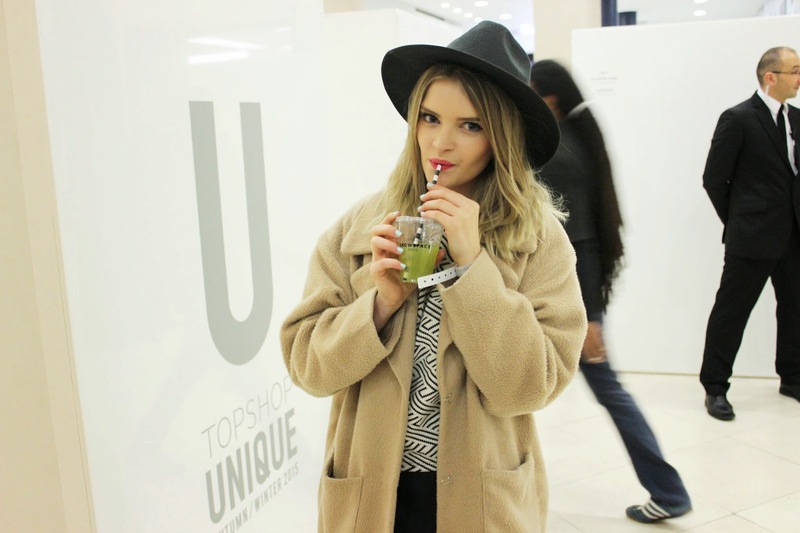 Did you get giddy over Topshop Unique? Love your outfit Meg, the camel coat was a good call! Ah Meg you look so lovely! The whole outfit is absolutely gorgeous, suits you really well. Hope you had a fab time!